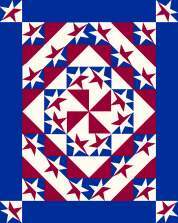 96 pages, 12 complete quilt patterns, color throughout, published September, 2002. Shakespeare knew it when he said, "The play's the thing." 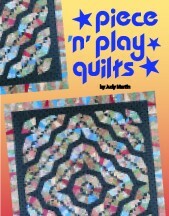 Judy Martin knew it when she decided to write Piece 'n' Play Quilts. Now you can find out for yourself: It really is more fun and more satisfying when you can follow a pattern and yet achieve your own unique look by playing with the arrangement of the blocks. Each of the 12 patterns comes with full-size pattern pieces with grain arrows and trimmed points. 11 of the patterns are presented with accurate rotary instructions and illustrated cutting layouts. The 12th pattern (Steve's Star) is presented with paper foundation piecing. You can't fail to make a beautiful quilt every time you sit down and play with Piece 'n' Play Quilts. 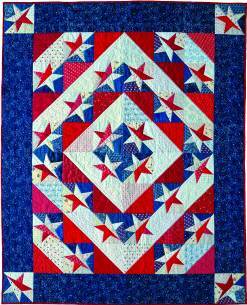 Click here to see a gallery of all the quilts from Piece 'n' Play Quilts. 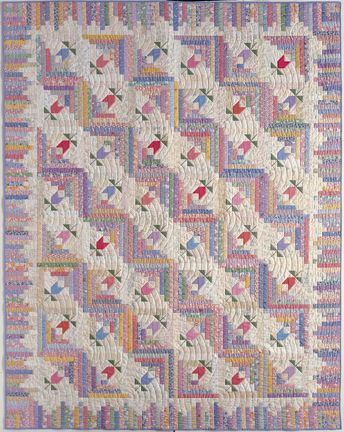 Quilters have been playing with blocks ever since the first Log Cabin was stitched, but Piece 'n' Play Quilts is far more than just Log Cabins. 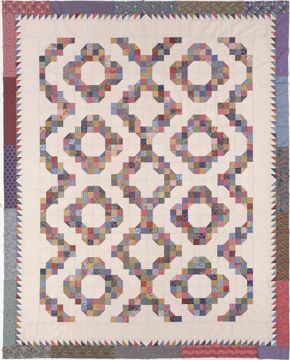 Any asymmetrical block that makes secondary patterns when turned in different directions is a Piece 'n' Play quilt. Drunkard's Paths, Fans, and Rail Fences lend themselves perfectly to Piece 'n' Play fun. In this book Judy Martin has designed some fabulously simple variations on these tried and true favorites. Isn't it time you made a play date with Piece 'n' Play Quilts? Yes I'm being followed by a Star Shadow. Apologies to Cat Stevens! Star Shadow (left) is an innovative pattern that has each star casting a shadow. Steve's Star (right) is a 5-pointed star block that plays like a Log Cabin! These are just 3 of the setting possibilities when you play with Steve's Star! All 3 of these quilts use the same number of blocks (and therefore the same yardage) as the quilt in the photo above. You can have all the fun of being creative without any of the hassles. It's as easy as playing! What People are Saying About Piece 'n' Play Quilts! "You have done it again! Your new quilts are wonderful. I just wish I had just a thimbleful of your sense of color. You always amaze me with the color schemes. I always love them, always." "I love the book. The hardest part is choosing which quilt to make first." "I really like the new idea of extra setting suggestions!" "What a fascinating book! 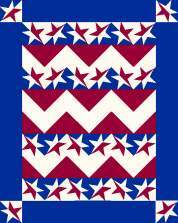 Even some of my family members who are not even kind of into quilts were impressed with the options for variations. My husband had some particular favorites, so I'll have to get him in on the playing part when it's time. 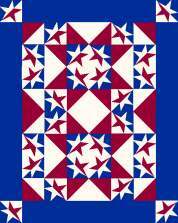 And my sister-in-law was really taken with the quilting patterns, and she doesn't sew at all. 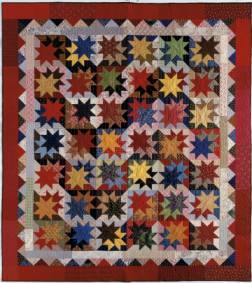 Thanks for producing such interesting and phenomenal quilt pattern books." light and dark halves of the block are not divided equally, thus creating a ripple effect. Roundabout is a Drunkard's Path variation with no curves! After you make the blocks, you can play around with the arrangements until you find the one that's perfect for you! Here are just a few of the many reasons you'll want to get your copy of Piece 'n' Play Quilts today. The quilts are beautiful. They echo traditional patterns, yet they are completely new. It's less expensive than a Florida theme park vacation but every bit as fun. The 12 patterns are complete and, best of all, they are accurate. You can plan a Piece 'n' Play Quilts party with your friends. Invite them over, serve cookies from Cookies 'n' Quilts, and have a blast arranging and rearranging the blocks until you get exactly the look you want!